Depreciation. Don't you just hate it? Nothing takes the shine off a fancy new bike faster than knowing that its value is plummeting from the moment you collect it. Sitting in the garage admiring your new toy, listening to that tick - tick sound of cooling metal, you might as well be listening to pound notes hitting the floor. You can get round it by riding some rusty old nail, but unless you are a terminal skinflint or seriously broke, it is hardly very satisfying. It is also not likely to very safe or reliable either. But there is a bike, or rather a whole family of bikes, that you can buy for a reasonable sum, maintain easily, enjoy riding safely and reliably, and still sell a couple of summers later for the same as you paid for them. Ladies and gentlemen, let me introduce the air-cooled, opposed twin cylinder BMW, known and loved as the Boxer. BMW launched this format as far back as 1923, and the nickname Boxer comes from the idea of the two pistons punching in and out in unison like two boxers, so now you know. The bikes that I am about to draw to your attention were launched in 1969, and only finally disappeared from the catalogue this year. You therefore have over twenty five years worth of bikes to choose from, so there should be something to suit every pocket. Boxers come in all shapes and sizes, from 450cc to 1,000cc, as roadsters, tourers, sports bikes, off-roaders, and even as side-car combinations. 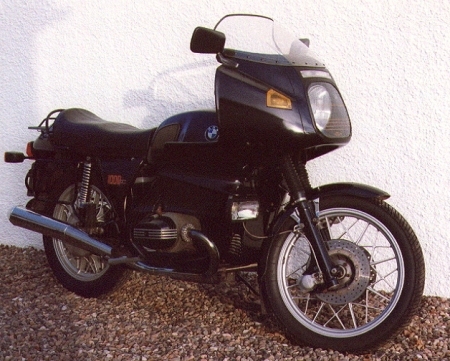 The bike that you see pictured is a 1979 R100RS, considered by the cognoscenti to be the pick of the crop. This bike broke new ground when it was released as it was the first production bike to have a full fairing, and the extensive R&D that BMW put in back in the sixties must have been good as it is still as clever a design as anything produced since. Despite being seventeen years old, with at least seven owners and probably 100,000 miles behind it, this bike goes and handles better than it has any right to, although the brakes are showing their age. It will outdrag any car away from the lights, will easily reach a three figure speed, and given the opportunity will stay there all day with no stress. This bike actually belongs to my brother, so I know more than a bit about it, like that over last summer he covered 12,000 miles on it, including a trip to France, with hardly a hiccup. Best of all is that it costs £85 per year to insure under classic insurance, and if he sold it today, he would almost certainly recoup his investment, possibly with a small profit. Who needs depreciation? The key to the success of these old Bimmers lies in the fantastic level of build quality which the pernickety Germans engineered into them in the first place. I am not talking about flashy technology here, in fact quite the reverse, but every component is made to the best standard possible at the time. In their day, these were extremely expensive bikes, affordable only by people who knew the value of what they were buying, and consequently most of them were maintained to perfection in their formative years. Few were thrashed or abused, and that makes them a restorers dream come true. Take even the most dog-eared old Boxer, apply a bit of elbow grease and alloy polish, and you will be amazed at the results, especially if your attempts to date have been with rusted old Nortons and oxidised Suzukis. The internals are as close to bullet-proof as you can get, and even if some more serious mechanical work is required, they are inherently easy to work on. Add to this a string of mail order suppliers who will furnish you with illustrated catalogues, and send you anything from a grommet to gearbox within 24 hours, and you begin to understand why these bikes seem to go on for ever. There is also a 6,000 strong owners club which is a vast repository of knowledge and enthusiasm, not to mention a great network for cheap spares. Prices? Anything under £1,000 is likely to be a basket case, but around £4,000 will buy you something which has just had it's first MOT, is just about run in, and ready for the next twenty years of riding. Reasonable ones start from around £1,500, but be prepared to spend some money thereafter. Exhausts rot through, unless someone has changed them for stainless steel (worth the extra), batteries fail, some electrics can need replacing, and it's bound to need tyres. Bargain on spending another £500, but it's a fair bet you will get your money back when you come to sell it. I've owned two Boxers myself, and I sold both with all the ease of falling off a log. So what are the downsides of Boxer ownership. Well for one, it's unlikely that your mates in the pub will be overly impressed, and young ladies tend not to drool over them. They will definitely not keep up with the latest Japanese rocket bikes over a mile or so, yet strangely if you accompany one of these whizz bangs over a 500 mile run, you will often arrive first, as you don't have to get off every half an hour to prevent cramp in you legs. Remember the hare and the tortoise? And even if the guy on the Kawa-ninja-saki risks rigor-mortis and does get there first, just console yourself by thinking of how much depreciation his bike has suffered on the way there!